Although previous studies concluded that attempting to ignore irrelevant information slows people down, Johns Hopkins University researchers found that when people are given time to learn what’s possible to ignore, they’re able to search faster and more efficiently. The results, which offer new insight into how the mind processes difficult information, are published in Psychological Science, a journal of the Association for Psychological Science. In two experiments, researchers asked participants to search for certain letters on a computer screen. They had to find either a capital “B” or an “F,” among other letters of assorted colors. Sometimes, the participants were told the “B” or “F” would not be a certain color, like red. Other times they were given no color hints. 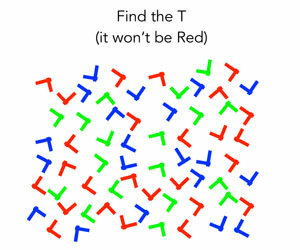 When participants were given one color to consistently ignore throughout the experiment, their reaction time slowed at first, but after extended practice, about a hundred trials, they were finding the target letters significantly faster than participants who weren’t given a color to eliminate. In fact, the more information participants were able to ignore, the faster they found the target. Although trying to disregard distractions might initially slow people down, the researchers concluded that over time, people are more efficient when they know what’s not worth paying attention to. The ability to ignore is a key part of the ability to pay attention, the researchers said. This work was supported by Office of Naval Research Grant N000141010278, National Science Foundation Graduate Research Fellowship DGE-1232825, and the Johns Hopkins University Science of Learning Institute. Of course ,b cuz u automatically look at everything u r trying 2 ignore it’s human nature! No info no time lost!! !